It's Friday, which means it's time for the answers to the Game Geek Quiz. If you haven't tried the quiz yet, click here if you want to see the questions without spoilers. Otherwise, read on! The original questions have been included in italics. The "official" right answer is in boldface. I've tried to provide context for every answer. 1. What was "Contra-Dextra Avenue"? In Wizardry: Proving Grounds of the Mad Overlord, the first game in the series, you saw the message "Contra-Dextra Avenue" when you took your first step on the very bottom level of the dungeon. This was a clue on how to find the wizard Werdna's lair. "Dextra," from the Latin word meaning "right" and "contra" meaning against. At every intersection, turn left. Simple. 2. What was the first (computer) adventure game that took a text adventure interface and added significant graphics? This was one of the easier questions: Sierra On-Line's Mystery House, authored by Naked Roberta Williams, is generally considered to be the first text adventure with graphics (fairly crude black and white drawings). 3. Who wrote most of the games for Sirius Software (example game: Gorgon). First name only is OK. The prolific Nasir Gebelli. 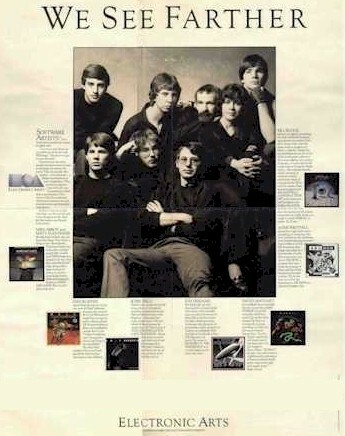 He also wrote Star Cruiser, Horizon V, and many other Apple ][ games. In addition, he was the main programmer on -- wait for it -- the early Final Fantasy games, as well as The Secret of Mana and other Square/Enix works. I expected more people to know this one: Electronic Arts. They pushed an ad campaign which portrayed game developers as artists, not programmers. The poster was very soft focus, with Bill Budge looking all butch, and Dani Bunten back when she was preoperative Dan Bunten, and the Free Fall Associates guys looking all thoughtful and clever. I actually had 3 copies of the poster until just a few years ago. Of course, now that I've thrown it away, it's worth money. The scan of the poster is courtesy Gotcha, a site well worth visiting. 5. Finish this phrase: "Ho eyoh he ___"
Hum. Iolo the Bard periodically sings this throughout the original Ultima. The four continents in that game are also named Ho, Eyoh, He, and Hum. One of the things that disturbed me about the Ultima games on an almost subliminal level was how through at least Ultima IV, the entire geography of the planet would change and no one would say anything about it. 6. This platform game was one of the earliest games to be ported to nearly every popular home computer (and game platform) in existence in 1983. It was famous for having versions on just about everything, from the Vic-20 up through all the Atari consoles and computers, to the Apple ][, and beyond. What was its name? This question, I've decided, is unfair because it is simply too vague to come up with a definitive answer. The answer I was looking for was Miner 2049'er. The following platforms had ports of this game: Atari 400/800/XL, Atari 5200, Apple ][, Atari 2600, Colecovision, Commodore 64, Vic-20, TI 99/4a, IBM PC, Gameboy, Thompson MO-5, Super Cassette Vision, and a Tiger Pocket LCD version. But basically, this is the one question in the entire quiz that I regret asking. It was a bad question. 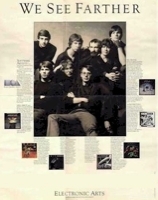 I learned over at ClassicGaming that the author of Miner 2049'er was also the author of a number of disturbingly enjoyable games for the TRS-80, including a really playable version of Berzerk called Robot Attack. I remember playing it in the local Radio Shack and being captivated. 7. In the superb chess-like game Archon, each piece had a counterpart. The dark goblin was the opposite of the human Knight. The dragon was opposed by the Phoenix. The basilisk was opposed by the unicorn. What light-side piece corresponded to the dark-side banshee? The Banshee's opposite was the Valkyrie. This question is tough even for Archon addicts, because the Valkyrie is so unlike the Banshee. Most of the pairings are between creatures which have fairly similar mechanics. The banshee has an area of effect "scream" which surrounds her, whereas the Valkyrie throws spears from a long distance away. 8. How can you open the jewel-encrusted egg without damaging the clockwork canary? In Zork I, just give it to the thief. 9. Rick and Ilsa. Heloise and Abelard. Guybrush and ______? From The Secret of Monkey Island. Guybrush's crush was Elaine. Christina earns Bonus Geek Points for remembering her last name. Pinball games, like card games, are not computer games (you can debate this with me, but you will be wrong). David Snider wrote David's Midnight Magic. Pinball fans who have played the game recognize it as a nearly exact replica of what was possibly the best pinball machine ever made, Black Knight. 11. Leisure Suit Larry was actually a with-graphics reworking of an earlier, text-only game. What was the name of that game? The emotionally scarring Softporn Adventure. 12. In Silas Warner's classic game Castle Wolfenstein, you played a prisoner trying to escape from a Nazi castle. Patrolling the castle were scores of Nazi soldiers. There were also SS officers who would try to track you down once they discovered corpses of common soldiers. The SS were very hard to kill because...? This one was guessable: they wear bulletproof vests. 13. In the game The Prisoner (and Prisoner 2), what ASCII character was used to represent the player? "I am not a number, I am a free man!" The symbol used to represent the Prisoner was #. 14. 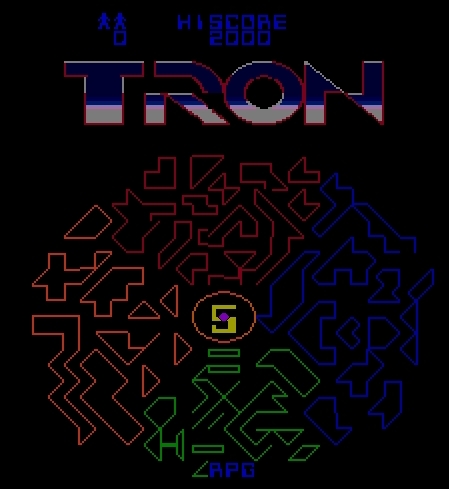 The arcade game Tron put the name of a computer language at the bottom of the screen to identify what "level" you were on; each time you cleared all four stages, the language changed. What language was used for the very first level? RPG, a report generation language developed by IBM. There are actually 12 named levels, as follows: RPG, COBOL, BASIC, FORTRAN, SNOBOL, PL/1, Pascal, Algol, Assembly, OS, JCL, and "User". After level 12, all the levels are named "user". Me, I could only rarely make it past SNOBOL. 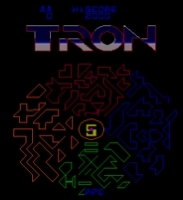 I didn't think Tron was a very good game, but there was a sister product called Discs of Tron that was actually superb. It's rather hard to play well on an emulator, because the controls aren't really suited for it. 15. What were the dungeons in the game Realm of Impossibility named after, thematically? Tartarus, Gehenna, Elysium, and so on -- the lands of the dead. 16. In the Atari 800 game Star Raiders, what color did the screen turn when you turned on your shields? All spaceships have to have blue shields. I'm pretty sure there's a law about that. 17. Everyone knows the story about how Warren Robinett hid his name in the Atari 2600 Adventure cartridge as a hard-to-get easter egg. Most people who played it obsessively have done it, I'd guess -- you have to go into the black castle, find an invisible dot, drag the dot back across the dungeon, and then figure out that it lets you walk through a certain wall, if you're dragging it behind you. Your reward is seeing the creator's name, in glowing chromaluminescent letters. (And if you've never tried Adventure, try this Flash version). Fewer people remember that the three cute duckies fearsome dragons who chase you have names. What are they? The yellow, green, and red dragons were Yorgie, Grundle, and Rhindle. They each had different roles, too -- Grundle was the God of Guarding Miscellaneous Objects (like the magnet), the fearsome Rhindle generally guarded the white key, and Yorgie guards the chalice, but for some reason never adequately explained is afraid of the yellow key. 18. This Atari computer game used the theme song from the Alfred Hitchcock TV show ("Funeral March of the Marionettes"; MIDI sample is not actually from the game) for its title screen. What game was it? Still the best reason to install an Atari 800 emulator on your computer twenty years later, this game was called Shamus. The Underdogs describes the game as Adventure meets Berzerk, and I think that's a fair assessment. 19. This game had a cult following that lasted well into the 1990's, despite the fact that it was practically unplayable. You and your opponent each had a shield and an axe. The camera was situated directly above you. From this odd top-down view, you could independently control your left arm, your right arm, and move around. Combat consisted of flailing into the opponent while "blood" spurted until pieces started falling off. Then the guy who was losing would run away, and you would chase him hopelessly for 10 minutes cursing the controls. What was the name of this game? The Bilestoad. There's an interesting interview with the developer, Marc Goodman, where he talks about how he implemented the game. "Datamost only sold around 5,000 copies of the game. I've gotten email from a lot of people and even met people who know and love the game and you know what? I've never met or talked to anyone who had an official copy." 20. How many hostages did you have to rescue to have a 'perfect' round in the original Choplifter? There are 16 hostages per level -- four in each building. I probably lost more hostages by squishing them than by being shot down. I hope you enjoyed the quiz, and the memories. As of the time I posted the answers, there were correct guesses made to 12 of the 20 questions (13, if you count jon's near miss on my poorly-formed Miner 2049'er question). I was surprised that no one got the Wizardry or Ultima related questions, but maybe that's just an indication of the poor way in which I spent my time as a teenager. If you're so inclined, throw your own questions down in the comments below. It can be your turn to try to stump me, instead.